Yesterday in Ohio is was 37 and that felt warm! Isn't that crazy!? Having temps in the single digits has me continuously reaching for soft, warm, and cozy. This sherpa jacket is the coziest Winter piece. I wore this outfit this past weekend with my hubby to grab a casual dinner with some friends. So we snapped these pictures with my phone. 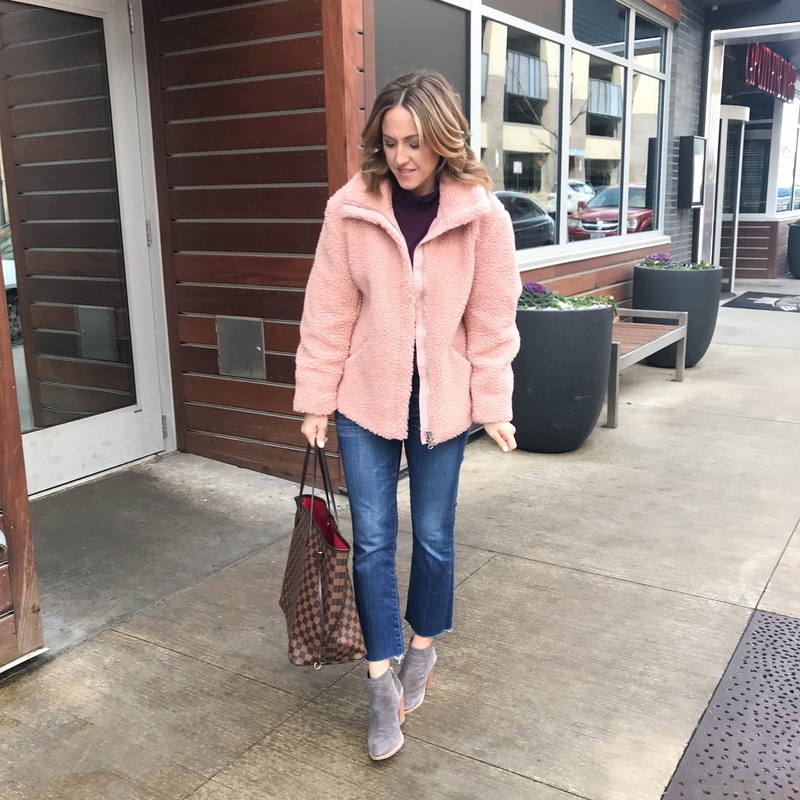 I'm sure by now you know both Betsy and I are fans of blush pink, so as soon as I saw this coat I knew it could be a winner! 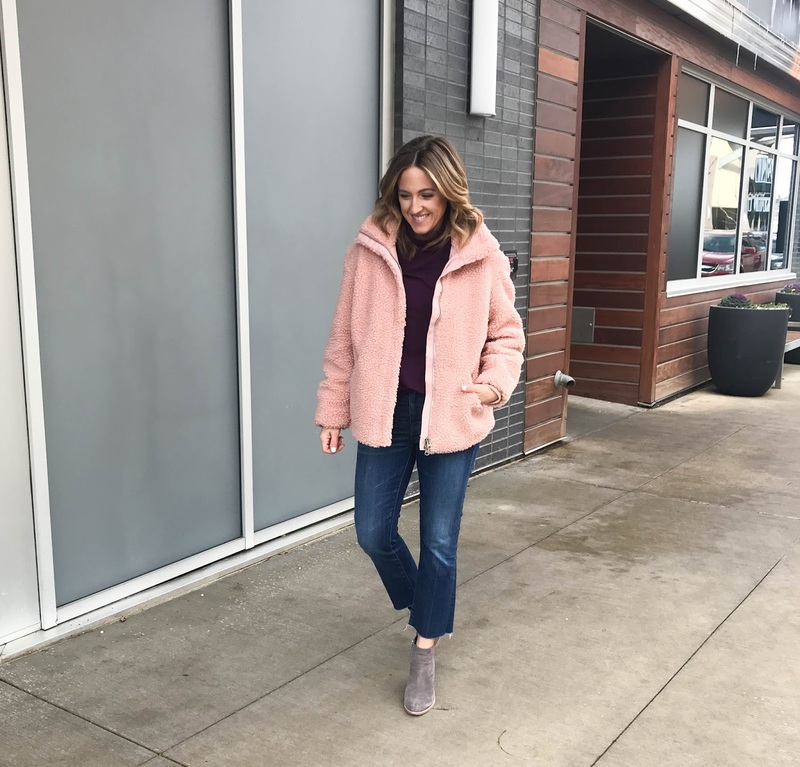 I had been on the hunt for quite a while for a sherpa jacket that wasn't too overwhelming. I really like the collar on this one, how it zips up, and it has a ribbed cuff which helps it stay in place. 1 - Today is our anniversary. We've been married 14 years! That's crazy - boy how time flies. 2 - I just started using this leave in conditioner. I've been trying to repair my hair from a bad coloring episode last year. It's been quite the process to get it healthy. So far, this is making my hair really soft. I had been using this trauma treatment which I liked too. I just finished the bottle and like to try to products to "shock" my hair. Do you have a conditioning treatment you love? 3- A big trend in jeans moving in to Spring are light wash, cropped boyfriend jeans. Do you have a pair? I've been searching for a pair that won't break the bank. I love these boyfriend jeans but don't want to pay $200. Yesterday I bought these. On sale and under $40! Definitely worth a try. I bought 2 sizes so I'll let you know how they fit. How cute are the ruffles on this turtleneck!? Such a pretty little detail. Oh - and it's currently on major sale for just $10!